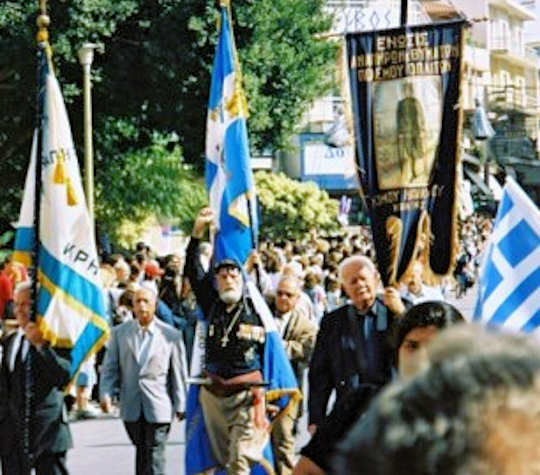 Oxi Day in Crete - 28 October is a Greek National Holiday. Oxi or Όχι means 'No' in Greek. This is the sentiment taken from an important turning point in WWII, which Greeks celebrate all over the country, and indeed all over the world, on October 28 every year. Well, let me tell you a story...Greece did not immediately enter the Second World War in 1939, yet had a history of alliance with Britain and the allied forces in Europe. During WWII, the fascist leader Mussolini was in power in Italy, he had aligned himself with the Nazi German regime headed by Hitler. In the year 1940, on October 28, Mussolini sent the Italian Ambassador in Athens to see the Prime Minister of Greece, to ask for his surrender and for access for Italian forces to enter Greece. Italian troops were at that time located in Albania, close to the Greek border. The Prime Minister of Greece, Metaxas, refused this ultimatum from Mussolini, thereby ensuring that Greece was now at war. The Greek people took to the streets all over the country chanting 'Oxi! ', and from then on this became the catch cry of resistance to the fascist forces. Greek armies fought and won against the Italians in the mountains of the border and this legendary defeat, as well as the resistance to German invasion of Crete, became important battles in WWII, although terrible losses were experienced all over Greece in the war against Germany. Parades are held in most towns of Crete on October 28 every year. Today the parades are a safe family event, full of colour and pomp and ceremony and Greek and local pride. You can expect traffic delays near the parade routes as some streets may be blocked for different events and celebrations. Many, many buses full of school children will be travelling to and from the town centres to enable the kids to walk in the parade. All archaeological sites will be closed, along with most businesses and services. As well as school and military parades, there will be special Orthodox ceremonies in the major churches in the capital towns. You may choose to attend a ceremony in one of the central cathedrals in Chania, Rethymnon, Heraklion or the town of Agios Nikolaos. 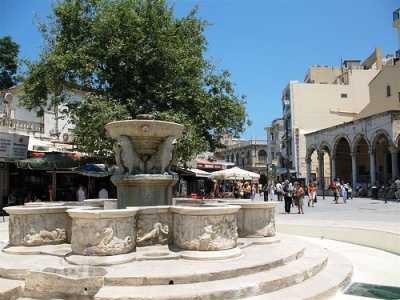 Kournaros Square is a good place to see the parade in Heraklion. This is a very central square at the end of 1866 Street. Walk down from Liondaria Square. 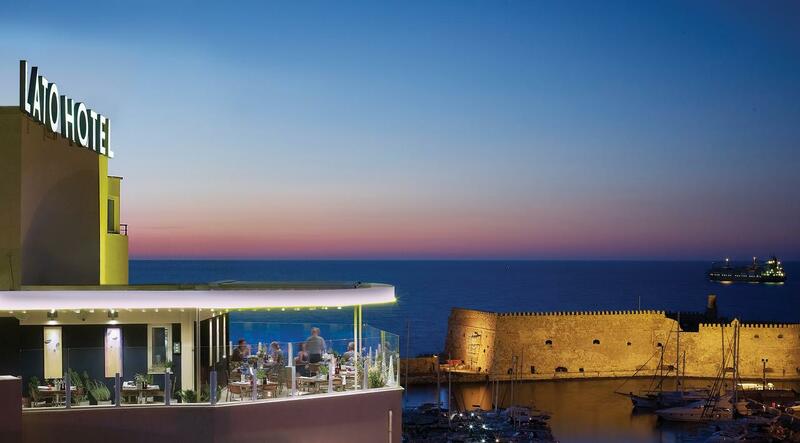 The Lato Hotel is a quality boutique hotel in the centre of town, close to the port and bus station. It is also very easy to walk everywhere on the safe pedestrian streets from this hotel to see the parades. 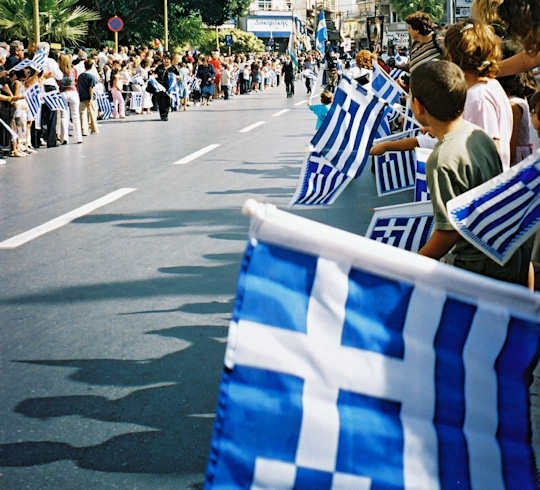 Επέτειος του Όχι - on this day of national pride there are extensive parades in central Athens. Expect some disruption to services and some closures. 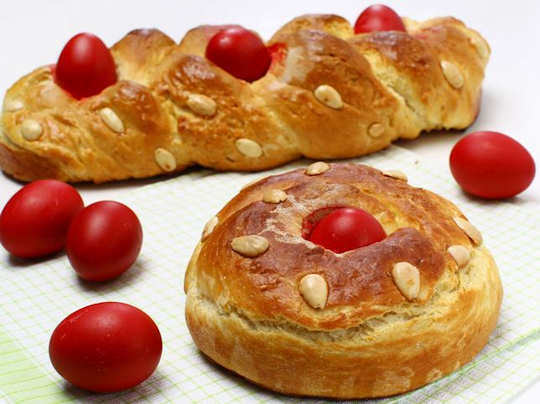 The best thing to do is to join in and watch the parades at Vasilissis Amalias Ave, Panepistimiou St and parts of Vasilissis Sofias Ave from the early morning, near Syntagma Square. There will be road closures surrounding these areas, so it is best to walk to see this on foot. Here Professor Karalis of the University of Sydney explains the significance of these commemorations, with some excellent footage of the elite Evzones unit, as Greece’s Presidential Guard, at the Acropolis. The Adrian Hotel in Plaka is a mid-range affordable hotel in the centre of Athens, within walking distance of the Acropolis and many of the sights of downtown Athens. 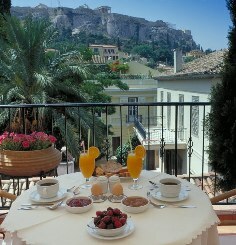 With views to the Acropolis from its rooftop restaurant, this makes a good choice from which to enjoy Athens, including the parades and events on this special day. The Acropolis Museum allows free entry on this day. 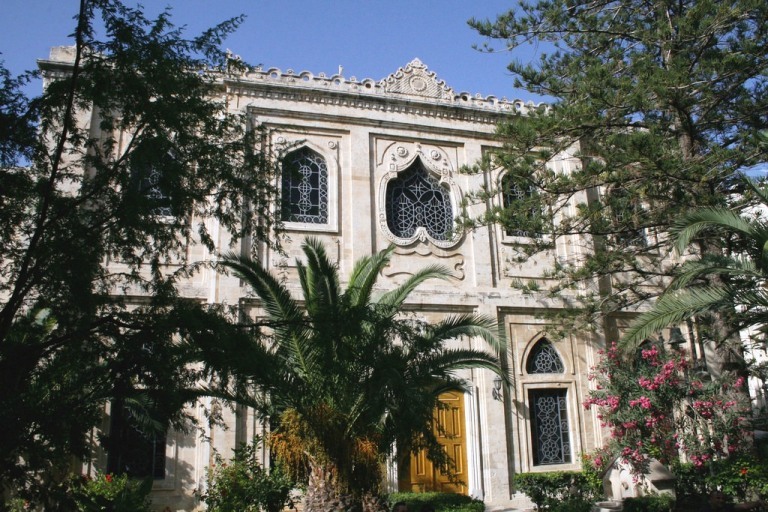 The museum is near to Acropolis metro station and opens every day at 8.00am in summer, with closing times varying throughout the week between 4.00pm and 10.00pm. 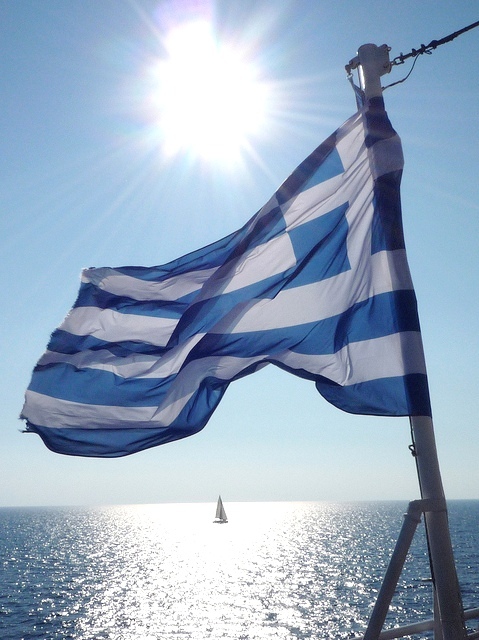 In the US and other places around the world with a Greek diaspora, the day is also commemorated in different ways. The Washington Oxi Day Foundation has created this video to explain the importance of this milestone for Greece and Europe and the history of world politics. As you travel around Crete, you may experience some closures on these days. It is always best to check on the opening times of archaeological sites prior to leaving your hotel, as these may vary due to holidays and the Ministery of Culture website is not always totally accurate as to the local opening times. Check with your hosts about the opening times of Knossos Palace, and all the Minoan Palace archaeological sites, so as not to be disappointed when you get there. You can fly into these from many hubs all over Europe. Or you can fly from Athens, the flight time is around 1 hour. Which Airport to Use in Crete?